US manufacturers may be going slow in terms of "digitizing" their operations, and face criticism in some quarters for moving too slowly, but the careful steps by most manufacturers to go digital and follow the "Industry 4.0" model are happening for good reasons. 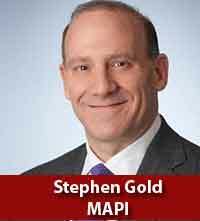 So says Stephen Gold, writing recently as a guest column in IndustryWeek magazine and also on the web site of MAPI – The Manufacturing Alliance, where Gold is CEO. So the "clock speeds" of consultants and tech providers on one hand and that of manufacturers on the other are often significantly out of phase. Gold cited one report predicting digital disruption would replace 40% of "incumbents" in a dozen industries by 2020 – massive disruption to once entrenched manufacturing leaders. "The warning: If you're clinging to old ways of operating and delivering value, you're already losing," Gold writes. But of course, such warnings about the demise of waves of current manufacturers have proven way overblown and premature. Gold says there is little doubt that new technologies such as artificial intelligence, data analytics, and cognitive technologies "will eventually lead to the development of global systems that create dramatic efficiencies and enable business leaders to make more informed integrated decisions." But we're still very early in the game, Gold argues, and manufacturers who haven't figured out how to apply Industry 4.0 across their companies are far more the norm than the exception. As evidence of that, Gold references work he has recently done with Indiana University's School of Public and Environmental Affairs, where the university and MAPI brought together experts from 18 manufacturing firms for a roundtable discussion on current manufacturing issues and how to stimulate progress in AI and digitalization. The perhaps surprising result: attendees walked away with a better understanding of why, in the current technology and policy environment, "an optimistic but cautious approach presently makes business sense for most of their companies." However, many pundits in the manufacturing sector, including policymakers, academics, consultants and technology providers, don't fully comprehend the complexity of the challenge of going digital for manufacturers. Gold notes that it is still common that information technology (corporate computing and product development) and manufacturing operating technology operate largely independent of each other. While that model is changing to an extent, "there's still a notable difference between how manufacturers approach these areas," Gold says. He cited, for example, how risk-taking with IT in consumer products is far different from risk thinking within OT for manufacturing systems. Comments in the roundtable noted that if glitch appears in a computer operating system, you reboot the software or the computer. But when a glitch appears in a manufacturing operating system, the entire plant can go down because of the numerous dependencies in the OT environment. So naturally manufacturers are very cautious with changes to their OT environments. Also different are the priorities for IT and OT with regard to standards and recommendations relative to cyber security. Gold said one roundtable executive noted that the order of priorities in IT is "confidentiality, integrity, and availability." Whereas in OT, it's reversed - the order of priorities is availability, integrity, and then confidentiality. SCDigest isn't sure that is completely true, but there is a point to be made fore sure. "Requirements for cybersecurity written for IT may make little sense for OT - they require different approaches," Gold notes. He cites the example of the common use of patches in the IT world for security purposes not being feasible for OT in a manufacturing setting, given the priority of availability. "Manufacturers often only patch OT once a decade," Gold says. Another challenge: there are a large number relatively new firms offering a wide array of technology and digitization solutions for manufacturers, each touting their own as the platform that manufacturers need. Gold cited one global manufacturing executive as saying that "Technology is changing so fast, when a salesman from a 30-person IOT company tries to sell a $5 billion global company a specific tech solution, there's going to be some hesitation. I don't even know if that company will be around in two years." The bottom line Gold says: "The caution among manufacturers in going digital isn't about a lack of internal strategic alignment and short-term focus. The world of manufacturing is complex. There are countless pieces to this puzzle, and the technology piece is likely not the hardest to solve." Almost all manufacturers share certain characteristics, Gold points out, such as increasingly complex supply chains, using production assets for decades before replacement, and the very real need to avoid production downtime at all costs. These considerations go a long way to explaining the major challenges faced by manufacturers wishing to create and invest in smart factories – and their seemingly slow pace. Any reaction to Gold's take on digitization? Let us know your thoughts at the Feedback section below.